Investigating Agatha Christie's Poirot: Episode-by-episode: How Does Your Garden Grow? The first episode of the third series (excluding the centenary special The Mysterious Affair at Styles), this episode is based on the short story 'How Does Your Garden Grow? ', first published in 1935. The story was adapted for television by Andrew Marshall and directed by Brian Farnham. The adaptation stays more or less true to its source material, but with several embellishments. First, the element of the Soviet Union and Communism (hinted at by Mr. Delafontaine in the short story) is expanded into an entire subplot / red herring in which Katrina has a lover at the Russian Embassy and comes from an old aristocratic family in Russia (she's also a Russian Orthodox by faith). 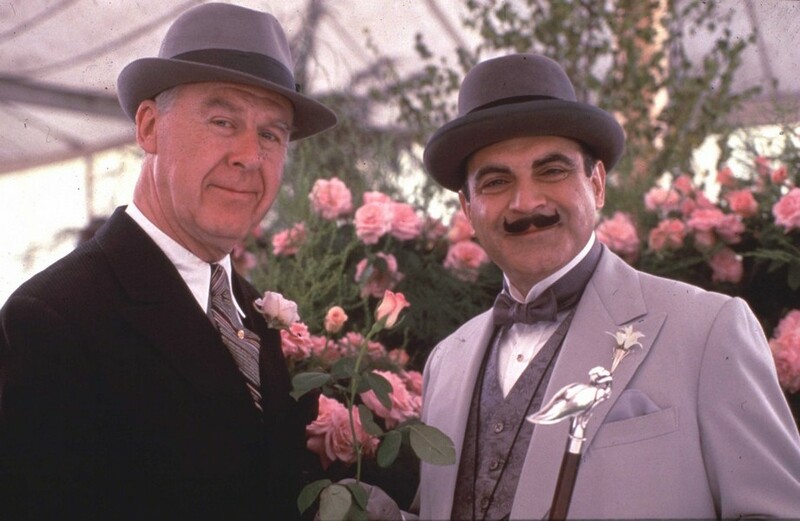 Second, there's an entire subplot on Poirot's purchase of a perfume and the unveiling of a rose bearing his name at the Chelsea Flower Show. The Flower Show also provides the setting for a meeting between Poirot and Miss Barrowby. She hands him a packet of seeds of a rose named 'Catherine the Great', a clue that will later lead Poirot to uncover Katrina's back story and discover the true culprits. Quite a clever addition, actually. Third, there are several scenes in which we are shown the going-ons at the Barrowby household, including the prescription by the doctor, the drinking of Mr. Delafontaine and the crime itself (as recounted by Inspector Sims in the short story). Fourth, Japp and Hastings are added to the story, and Miss Lemon's role is somewhat expanded. Japp partly replaces Inspector Sims (but a significant part of Sims's role is given to the family doctor, called Sims, and the solicitor, in the adaptation). Hastings gets a subplot of his own, recovering from supposed hay fever (later revealed to be an allergic reaction to Poirot's cologne) and searching for a merchant's bill, destroying Miss Lemon's filing system. Miss Lemon gets to investigate together with Poirot, interviewing the maid at the house and visiting the morgue with Japp and Poirot - and of course visit the fishmonger (like in the short story). Fifth, the nursery rhyme is given some more prominence; Miss Lemon notices the unfinished edging of the flower beds and finds a silver bell (seen in use by Miss Barrowby throughout the episode so far) buried there. Finally, there's an expanded denouement, which includes new elements of stock speculation and the fact that Mrs. Delafontaine paid in cash at the fishmonger, as well as the ever-present chase scene. Still, when all the changes are taken into account, they make sense and clarify the plot rather than deviate from its source. Well done. Brian Farnham makes good use of the many outstanding locations. A list of these would include the Freemason's Hall (here: the Russian Embassy), and the real store G.F. Trumper in Mayfair, where Poirot buys his perfume. See this link for location photos.The extravagant scenes at the Chelsea Flower Show are simply a joy to watch (imagine the number of extras for those scenes alone!). The soundtrack is great, and this one has been released on Gunning's latest CD (titled How Does Your Garden Grow? - one of the few tracks to feature the entire score of an episode). Marshall has added some nice character development here. For instance, we have Japp attending the flower show - and demonstrating his expert knowledge of flowers (a hint of Christie's character, who enjoys gardening). Also, there's Miss Lemon's comment that she 'used to help in the hospital ward during the war' (I'm not sure if that's from Christie's stories - probably not - but it's a sort-of reference to Christie herself, who worked as a hospital dispenser). Finally, there's Poirot's comment 'One day I hope to retire to grow the vegetable marrows' (which I've sadly had to ignore for my chronology of the episodes). In terms of guest actors, Anne Stallybrass (Mary Delafontaine) really stands out in this one, as does Catherine Russell (Katrina), both conveying the changes their characters go through in appearance and attitude. I didn't totally get what the deal was with Katrina. I get that she was a Russian aristocrat...but why all the secrecy about her background? Were there Stalinists, even in England, who could harm her? Vera Rossakoff, remember, FLAUNTED her title. She talked about being a refugee and was lonely, but didn't seem to be in danger from Stalin's party directly. Was it implied that her friend/boyfriend worked for Stalin's government (at the embassy) but secretly he was an aristocrat, too? Does the solicitor rig the pony competition just to give Poirot a coded message? Those poor girls. Japp never explains why his men were watching the house. It's nothing to do with Katrina being a Communist agitator, because he dismisses that idea when it's first suggested. Japp mentions to Poirot and Miss Lemon that the Yard was alerted by the family doctor who suspected the death was murder and not natural causes. And a subsequent scene with the doctor seems to point direct suspicion at the Delafontaines. I got the impression from both these scenes that the stakeout was to see if they could observe any suspicious behavior that would indicate who might have committed the crime. Outside of the real Russian Orthodox Cathedral in London, but the interior, sorry but nothing like it. Obviously Greek. Interesting. They obviously used two different locations, then. I don't think that the seeds help Poirot uncover Katarina's back story at all - it's the icons which do that - although they do help Japp, and help to mislead the viewer. Also, I distinctly heard Miss Lemon say that she worked in the hospital morgue during the war. Is Freemasons' Hall the most utilised location ever in these episodes? It was used in 'How Does Your Garden Grow?' as the Soviet Embassy, the Hotel Magnificent in 'The Adventure of the Western Star', the Astoria Hotel in 'One, Two, Buckle My Shoe' and the offices of the Sunday Comet in 'Mrs McGinty's Dead' ... It's a stunning building BTW if anyone wants to visit. Padding the story by adding the Flower Show and Russian Embassy scenes were good ideas. The Flower Show must have cost a bundle to stage. I wish they had credited the garden location. Surely they did not create the garden just for one episode? I assume they borrowed someone's garden for a location shoot. I don’t know who Instantloans Delhi, EG MEDI, City Spidey etc are but they are clearly breaching the terms of this page. They are advertising whatever it is and NOT commenting on Poirot episodes and are therefore NOT welcome here. Does anyone else agree? Totally agree. If possible their domain should be blocked or the ISP.